BOOM....there it is again. The feeling of pain, grief, loss, brokenness and potentially a multitude of other feelings that may flood one's heart, mind and emotions. All is well for a period of time and then something such as a holiday or other memory sparks the before mentioned emotions. No matter how it came about, this is often what it is like for those who largely grew up without a father and or mother. Father's day or Mother's day can be a hard time for those who never knew or didn't have their Father or Mother actively a part of their lives. The pain is real. "An on-going emotional, social or spiritual deficit ordinarily met in a healthy relationship with dad that must now be overcome by other means." As for me, this helped clarify many things as it was my reality growing up with an absent biological father from late pre-teens through today. Maybe it's your reality too? If it is or was, then you know the pain is real. I encourage you to face this head on with the Lord's help! Allow Him to show you His love and heal you. The day Jesus drew me to Himself and saved me was the beginning of the healing for me as He showed me through His Word the goodness, love and perfections of our Heavenly Father. As I turned the pages of God's Word (and still do today) He revealed Himself to me and reminded me that I was forgiven completely, loved unconditionally, adopted as His son, accepted by Him, secure in Him, significant in Him, He lavished His grace upon me and so much more in Him. I pray that you likewise are encouraged that your Heavenly Father is your perfect Father and regardless of your earthly father's behavior, He loves you very much not only in word but also actions! In connection with this, if you are reading this and you're a dad yourself, count it as a true privilege and do your best to be like your heavenly Father as you parent the children He's blessed you with. You will make many mistakes (because we're not perfect) but God will empower you and give you the wisdom you need to be the very best dad you can be! Trust Him, rely on Him and lean on Him through your parenting journey. It's also worth noting that when you do mess up, it will go far if you humble yourself and admit it and seek forgiveness as needed. Make every moment count and remember it's not too late...if your kids are out of the house now or heading that way, start anew in a new and renewed relationship showing them you love them and that they are valuable, worthy, capable and much more! Speaking again of earthly fathers, you may not have had a perfect day yourself, actually no one has, but if you had a dad who did His best to be present as much as possible, love you, provide for you and more...praise God as it's becoming a rare thing and if you had one...even with normal issues that may take place, having him is more of a blessing than a curse for you. 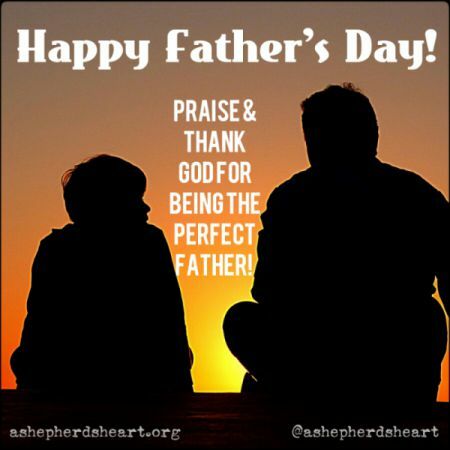 Now, if you had a great dad...celebrate him and praise God all the more! No matter your situation or background with your earthly father, I pray that this Father's day and each day ahead, you spend time getting to know your Heavenly Father more. Also, may you praise and thank Him for Who He is and all He continues to do for, in and through you! May you allow Him to heal the broken places that exist and comfort and grow you through the healing process. I'm praising and thanking Him along with you as it's an honor to be called His child and to be loved unconditionally by Him!